The Inn at Great Neck is located in the town of Great Neck, New York in Nassau County, Long Island. It is located in the heart of Long Island’s beautiful and historic North Shore (i.e., Gold Coast). Please note, some GPS devices recognize Cutter Mill as one word (CutterMill). See Weather for Great Neck, New York. Queens Midtown Tunnel to the Long Island Expressway (Route 495) East. Continue on 495 East to Exit 33 (Great Neck). At the end of the exit ramp, make a left onto Lakeville Road. 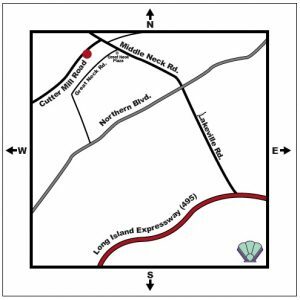 Travel North on Lakeville Road/Middle Neck Road approximately 2 miles to the 11th traffic light. Turn left at the Bank of America onto Cutter Mill Road. The Inn is on the left. Take the Belt Parkway East to the Cross Island Parkway North. Exit onto the Long Island Expressway (Route 495) East. Follow the directions above from Manhattan and Western Queens. Travel on the New Jersey Turnpike to exit 18W (George Washington Bridge). Proceed across the bridge and travel to the Cross Bronx Expressway (Route 95) East to Exit 6 (Throgs Neck Bridge). Cross the Throgs Neck and proceed onto Route 295 (Clearview Expressway). Travel on 295 to the Cross Island Parkway South. Travel 2.5 miles to Long Island Expressway (Route 495) East. Follow the directions above from Manhattan and Western Queens. Travel Route 95 (New England Thruway) South, to Route 695 (Bruckner Expressway) South. The Expressway will lead to Route 295 South to the Throgs Neck Bridge. Cross the bridge and proceed to travel South on 295 (Clearview Expressway) to the Long Island Expressway (Route 495) East. Follow the directions above from Manhattan and Western Queens. Cross the Tappan Zee Bridge. Travel on New York State Thruway (Route 87) South to the Cross Bronx Expressway (Route 95). Travel the Cross Bronx East to Exit 6 (Throgs Neck Bridge). Cross the Throgs Neck onto Route 295 (Clearview Expressway). Travel 295 to the Cross Island Parkway South. Travel 2.5 miles to Long Island Expressway (Route 495) East. Follow the directions above from Manhattan and Western Queens. Exit the airport and follow the signs for the Grand Central Parkway East. Travel the Parkway to the Long Island Expressway (Route 495) East. Follow the directions above from Manhattan and Western Queens. Exit the airport and follow the signs for the Belt Parkway East. Travel the Parkway to the Cross Island Parkway North. Exit onto the Long Island Expressway (Route 495) East. Follow the directions above from Manhattan and Western Queens. Travel East on Northern Boulevard (Route 25A) through the town of Douglaston. Continue past Leonard’s of Great Neck to the first traffic light, (Middle Neck/Lakeville Road). Make a left onto Middle Neck Road and travel for approximately 1 mile. Make a left onto Cutter Mill Road, the Inn is on the left. Travel West on Northern Boulevard through the town of Manhasset to Middle Neck Road/Lakeville Road. Make a right onto Middle Neck Road and travel for approximately 1 mile to Cutter Mill Road and make a left (there will be a Bank of America on the corner). The Inn is on the left. Travel the Long Island Expressway (Route 495) West to Exit 33, (Great Neck – Lakeville Road). Make a right at the second traffic light onto Lakeville Road. Travel North on Lakeville Road to the 10th traffic light. Make a left onto Cutter Mill Rd. The Inn is on the left.